Hill of the Herdsman Walk, Meall a'Bhuachaille, Loch Morlich, Rothiemurchus, Cairngorm mountains. Meall a'Bhuachaille rises up above Loch Morlich offering excellent views over the forests of Rothiemurchus and the majestic Cairngorm mountains beyond. The Glenmore Forest Park in the shadow of the Cairngorms is one of the most popular parts of Scotland, frequented by walkers, skiers and watersports enthusiasts. Meall a'Bhuachaille sits on the northern edge of this stunning scenic area and the summit is an ideal spot to cast your eyes over the surrounding countryside. Loch Morlich nestles in the native pinewoods of Rothiemurchus down to the south east while the distinctive pink granite of the Cairngorm plateau rises up behind. Here you'll find well known peaks like Ben Macdui - Scotland's second highest mountain - and Cairn Gorm and Braeriach and Cairn Toul with the Lairig Ghru pass cutting a dramatic deep channel between them. After a hearty climb the walk descends over the eastern slope of Meall a'Bhuachaille (translating from Gaelic as 'hill of the herdsman') to a tiny bothy at Ryvoan. Then the return leg cuts through a steep sided glen dotted with twisted Scots Pine trees and passes by An Lochan Uaine where the pure water glistens green on a sunny day and the sandy shores provide a fine point to pause. Pink heather graces the hillside as it dons its colourful coat of summer while blaeberry bushes growing by the path provide a refreshing snack towards the end of August. In winter a crunchy covering of snow transforms the whole area and a crisp clear day may see mountain hare or ptarmigan out in their winter whites. To the left of the forest shop, a green banded waymarker indicates the start of a grassy track that climbs up through the forest, rising steadily towards a junction a short distance on. Here, turn left and continue to climb as the sandy track gains height through the dense coniferous forest, a narrow burn taking its course down to the left. Along the way ant hills grow up making use of discarded pine needles. A kilometre from the start the way swings left to cross the burn on a substantial wooden bridge. It runs level for a few yards before turning right to climb again, the verges lined with heather, grass and blaeberry bushes. After a strenuous climb, the path emerges on to open moorland at the top of the trees. The summit of Meall a'Bhuachaille, glimpsed briefly through gaps on the way up through the forest, can now be seen clearly, standing proud ahead. 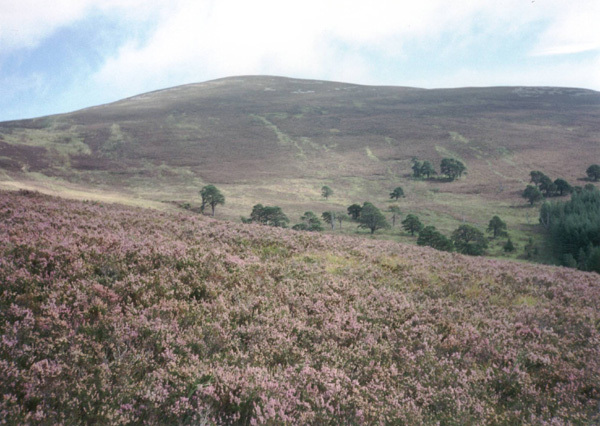 Continue to climb, a wide path cutting a route through the heather over peaty ground. 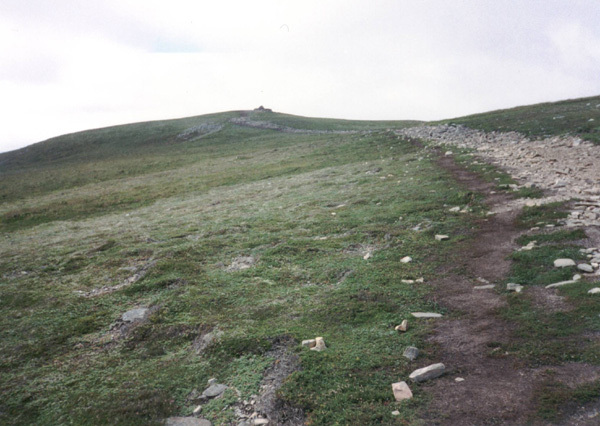 The path rises on to a broad ridge to the west of the summit where another path crosses at right angles. Turn right and following it up on to Meall a'Buachaille. The route up is dotted with cairns and the top itself boasts a large cairn and stone shelter. Descend east over an obvious path which loses height gradually initially. Several hundred yards beyond the summit, a path branches off to the right. Take either route as they join up again before the path drops more steeply behind Ryvoan bothy. Take care as the path can be muddy on the steep section and there are loose stones underfoot. At Ryvoan bothy, the path meets up with a track. Turn right at the small stone bothy and follow this south west. Half a kilometre on it reaches a junction of rights of way with green signs pointing back towards Nethy Bridge and Braemar. Carry straight on here, the track passing down through a narrow steep sided glen, the slopes dotted with Scots Pine trees and rock falls. At An Lochan Uaine, a small stretch of water surrounded by trees and, on one side, a scree slope, the track runs round above the west shore and a path branches off to the right. Don't take this but stay with the track, following it down towards Glenmore Lodge. A kilometre on from the lochan, the track forks into two. Take the right hand arm, cross the Allt na Feith Duibhe by a bridge next to a 'Glenmore' forest sign and a short way on emerge on to a minor road at Glenmore Lodge. Follow the roadway along behind the sprawling complex and continue down past Norwegian Lodge to a reindeer farm park at the bottom. Leave the road here and a stretch of pavement leads back to the start. 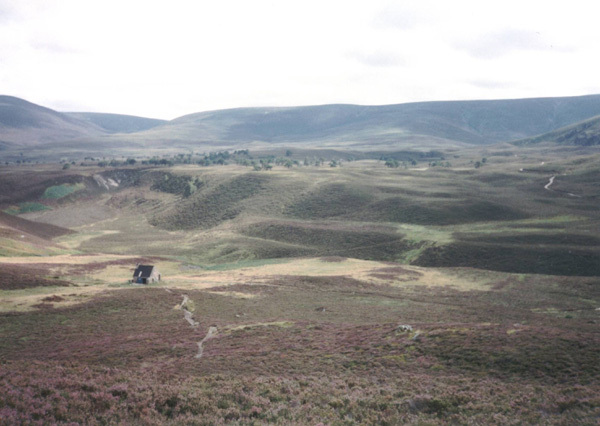 Maps OS Landranger 36 or Harveys Cairn Gorm. Start/parking Glenmore forest shop and visitor centre (grid ref NH 977098). This is located five miles from Aviemore on the road to the Cairngorms, the turn off on the left just beyond the entrance to the Glenmore campsite on the right. There is a charge for the car park, £1 at time of writing. Grading Good path up through forestry and over open moorland, returning on forestry track and minor road.